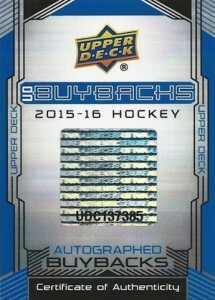 2015-16 Upper Deck Buybacks Hockey takes existing cards and creates something new. The main focus of the product is original Upper Deck hockey cards that have been reinserted in packs, usually with a signature. Each pack of 2015-16 Upper Deck Buybacks Hockey comes with just two cards. The first is a base card. These are the only new designs in the product. All 100 cards come already in a top loader and are numbered to 49. There are also parallels numbered to 24 and 5. The second card is the buyback. Drawing from 25 years of Upper Deck's history in the sport, there's plenty to draw from. A select group of Young Guns from 2013-14 and 2014-15 have autographed buybacks. Regular versions are limited to the player's jersey number. There are also Gold versions that are signed in gold ink and numbered to 25. The Autographed Young Guns Buybacks reach further into the past to include more key players from the past quarter century. Those that are more than two-years old are numbered no higher than 10. The same holds true with Autographed Young Guns Canvas Buybacks. These are also numbered to 10 or less. Looking at other brands, collectors can also find Autographed Black Diamond Buybacks of Triple and Quad Diamond cards, as well as Autographed Artifacts Rookies. Black Diamond and Artifacts buybacks all have no more than ten copies each. In more of the hodgepodge department, there are veteran and retired star base cards, inserts and jersey cards that have been signed. These are numbered to 5 or less. 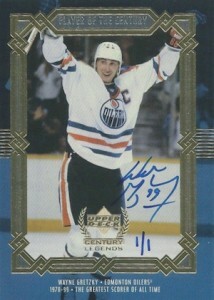 Randomly inserted are Wayne Gretzky Hot Boxes where every pack in the box has an autograph of The Great One. If you're concerned about sticker autographs, 2015-16 Upper Deck Buybacks Hockey has all on-card signatures except for buybacks that already have sticker autographs. But all newly signed cards are hard-signed. The majority of buybacks are signed, however there will be some unsigned original cards as well. Upper Deck is targeting just one to three of these per three-box case. 100 cards. Serial numbered #/49. The base cards are not buybacks. This includes previously unsigned cards that were purchased by Upper Deck from secondary sources and then sent to the athletes for signing. The cards are hand-numbered on the front of each card. View the full spreadsheet to see all the Auto Buyback cards. This includes cards purchased by Upper Deck that were not sent to the athlete to sign as the majority of the cards already featured autographs and/or memorabilia. Print runs noted are the original amounts, not the number available in the set. On average, five or fewer copies of each Vintage Buyback card were seeded in the product. View the full spreadsheet to see all the Vintage Buyback cards. Just read of a two pack break of UD Buybacks and in the first pack the collector ripped on Hobbyinsider.net the buyback auto did not have any marking to show it was a buyback. It was a Matt Duchene Glacial Graphs card and it was just as if the collector had bought a pack of Ice. I would have thought that UD would have marked each auto in some way as a buyback but that auto had NO marking of any kind. Only a two pack break but that is not good if others are the same way in my opinion. Ron, that’s because not all the cards are freshly signed. UD also bought cards already signed by those players. I pulled an SPx 2009/10 Rookie card of Schneider. This is a card originally signed by the player. UD simply through it again in the flow, if you catch my drift. Also, there are some unsigned cards there. I pulled a Dual Tundra Tag 1 of 1 no signature. And this is a question for Trey. Am I correct in the following assumption? If there are 100 base cards with 49 + 24 + 5 = 78 variants each, than it means there’s a total of 7800 base cards. Every pack contains one base card, which means there are 7800 packs/small boxes. Every big box contains 5 small boxes/packs, which means there are 1560 of them. Every case has 3 big boxes, which means there were only 520 cases produced. T.C.Boutique � That sounds right to me. Upper Deck does not normally confirm production rates but they did say the release would be very limited. Why would they not sticker the signatures they “bought” back with a cert as they have done in the past? This make zero sense. I would bet the farm many of these cards are just extra cards that didn’t make pack-out or were left over from volume decreases. Even if that is the case, sticker the cards! seems lazy and poorly executed. Different and fun product for the price. Some of the cards that are just repacked from previous products are pretty week $5-$10. UD should have at least put in cards worth at least $25 given the price. The hand numbered stuff is pretty cool though. 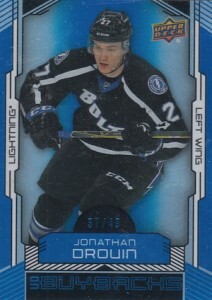 Upper Deck did a very poor job with the markers/pens the players signed the cards with. They should have sent them the same ones used by UD to number them. Many of the autos look terrible, because the cards were not designed to be signed originally. I would say about half of the autos are bubbly/streaky or blend into the card and get lost. I like the idea for the product it was just not executed very well. Got a 20 dollar card with no auto on it. That is so so lame. When are these up for purchase? Or are they already on sale? Deezy � On sale now. best product of 15-16. no McD and amazing value. has anyone checked what in-store signings go for these days? and you get a COA for each sig. love this stuff!